Discussion Pod :: View topic - November-06: Trailer Time! Posted: Tue Oct 03, 2006 7:34 am Post subject: November-06: Trailer Time! It's always good fun putting trailers together. I also built a streaming flash player for it based around this php streaming method, so we should be able to use streaming video more on the site if it works ok. The rest of this month I've been putting in place further front end icons (ghost hack has a lot of requirements) and working on help file art etc. It all adds up to make the finishing process not just a case of sticking a game on the website and seeing what happens. Moonpod is 4 this month It's been a long slog for us, and we've had problems along the way that have delayed us (which are well documented thanks to the transparency of our development as a result of our dev diaries ). It will be nice celebrating Fost's birthday, Moonpod's (on the same day) and (hopefully) Mr. Robot's launch soon . Hopefully in the future you'll see games coming out far quicker from us than three and a half years per title! I've been building an installer script - a huge lua-based batch file that takes all the game content, runs various conversions on it such as texture compression and then builds the installer. We needed a commandline based image manipulation application to resize some of the textures (Fost routinely draws textures at higher res than we need them, and then we use coloured mip-maps to determine which resolutions get displayed hen you run the game high res). 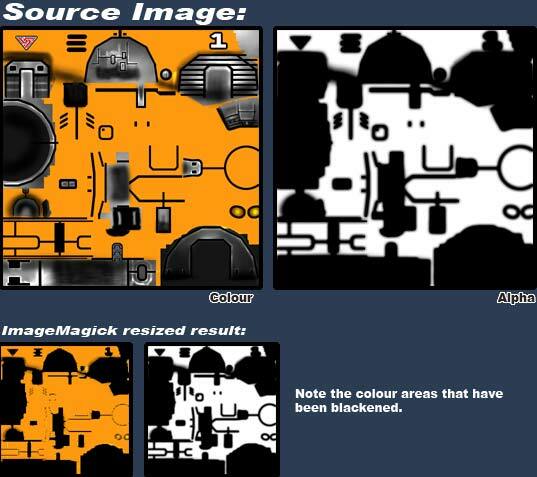 He found ImageMagick, which is a very popular open source batch image manipulation tool. I am always wary of using open-source applications. Of course, you can't complain when something is free, but I've always found that when you come across a problem with an open source app, it's really difficult to get anywhere. Documentation is more often than not built with doxygen and provides no real-world examples, and asking questions on a forum is a very hit and miss affair - getting told to read the manual (always our first port of call), getting answers to a question we didn't ask through mis-communication problems, or just getting no reply. Like I said - you can't really complain, but it does mean open source isn't always a great answer for critical areas of development. Sure enough, we came across a problem with ImageMagick: Images with alpha were being converted to pre-multiplied alpha on resize. Pre-multiplied alpha is generally used for video compositing, where the alpha channel is used as a matte. It means that all colour information where the alpha is black is lost. This isn't a problem when you are using the alpha as a matte - since the colour parts that are lost wouldn't be displayed, but when you are using alpha to say - control specular highlights in a game, it's a big problem. The online manual - whilst well written in this case, bore no fruit, so we were resigned to posting on the ImageMagick forum. This is where we had one of the best open source experiences we've had. The ImageMaick project leader and others started to get to the bottom of the problem within a few hours - we sent them example images, and eventually came up with a way to split the image into separate RGBA channels, work on them separately, and then recombine at the end. All of the best Open Source projects seem to benefit greatly from this kind of top level leadership. anyway, it was a great weight off our minds, and we thank the ImageMagick team for their prompt help. Final release executables have also had some of the loading code optimised, and loading speeds are much better than the debug exes we use during development. The lower install size means we've had a few options as far as music is concerned - it's always a tradeoff between quality and number of tracks. We've plumped for slighty better quality of tracks. So there's 9 tracks in the download version. We are also going to have a free extended music download like Starscape which of course has them at high quality, and will include 14 tracks. We would probably have gone beta about 2 weeks ago, but usability testing brought up a lot of issues we were not expecting, so I've (so far) added about another three weeks in to address usability. It's mainly really tiny things you would not have even guessed would cause a problem. for example: in ghost hack, when you defeat some enemy programs, some experience is awarded and there's a chance your powers will increase as a result. This was relayed to the player in a 'tickertape' along the top of the screen. During usability however, we found that because the text was always there, players didn't realise they needed to press the skip button to continue. This is fixed by moving the information into a box that pops up at the end of a battle, and now players realise they need to do something to continue. Watching someone play your game, then just sit there with a blank expression because they don't know what to do is quite a painful experience! As the game's developer, you become blinkered to user interface issues, because you spend so much time during development using workarounds that they become second nature and you rely on fresh sets of eyes to help you. Even so, ".. a man's reach must exceed his grasp...", and we should strive for perfection in all areas. It's something I want to look into, development methods to allow us to improve matters. Our current toolset does limit us to some extent; some more gui controls might help address issues in a more straightforward manner. I think what we really need is some form of layout editor though. Ripping out a gui screen and redesigning it from scratch is presently a daunting prospect, yet that's what we often find ourselves doing after our first run with focus group tests. I'm going to spend some time researching gui systems in the future - ceGUI and Direct Forms Designer are two I want to look at, but I'm interested to hear about any others. Yay finally! Too bad Starscape didn't have a trailer. Hoooray! And Happy Happy Birthday to you guys! I'll bake a tart later. I promise! To the posts: Very intersting imagemagic work there. We once used this too. But now there is some nvidia tool doing the psd>dds compression. They respond very quick too. Its not open source but what counts is that such things happen, when problems occur, right? I didn't know about imagemagic flushing the alpha black areas in color layer interesting! 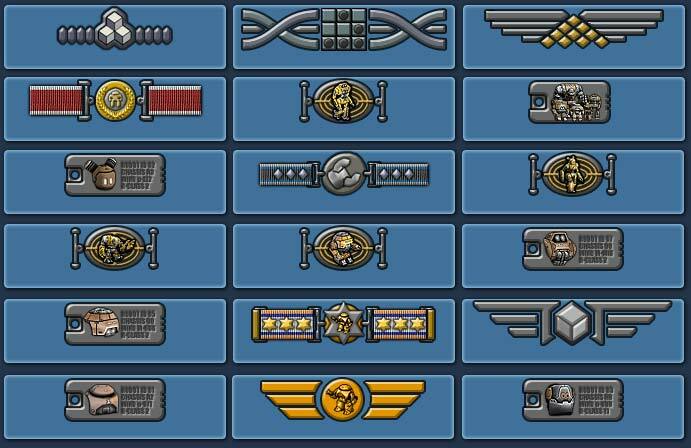 Achievements!! Darn cool! I mean I love achievements! Have no xbox 360 so far but I played BF2 some .. well some minutes .. ok hours, its already hours!... nahhh ok days, you got me! Surely addictive this one too. And cool trailer! A little small but maybe a HD-version later? Yeah! You know, I really want to make a Starscape trailer. I think I'll do one anyway, even though the game is out. Might be useful for people who want to see what's beyond the demo. But now there is some nvidia tool doing the psd>dds compression. DDS would be nowhere near good enough for what we are doing. We are using jpeg2000 compression for images. Although we aren't using imagemagick for that, we use a little commandline app based on the decoder we licensed. We are really just using ImageMagick to scale down textures. We test to see if the top level texture mipmap is being shown when the game runs in high res. If not, then the image quality actually improves by scaling the texture down - then you use the top level texture more often rather than a hardware scaled down mipmap. There's a high(er) res link above to a 23 meg mpeg. Even before downloading a demo a trailer is helpful! Maybe show some heavy devastating devastator action with 6 beam laser 4, beam drones and nano bomb 3. Ahhhhrg! Now I see! The trailer, yay very cool! Me so fool. pardon me! OK I see. So you use jpg2000 for "transportation". Well, right there its much better than .dds. But on the graphics card there is no jpg2k of course. there is only raw or .dds, isn't it? But on the graphics card there is no jpg2k of course. there is only raw or .dds, isn't it? Yes, I think when Poo Bear mentioned 'on the fly' use, he was talking about the loader decompressing them. With Starscape, the decompresser was based on the Open Source JASPER jpeg2000 code, and is incredibly slow. We licensed another one, and found that it's so fast we can use it in a normal loading situation. End result is a game much bigger than Starscape fits in much less space on the users hard drive. Not much of a worry for all those people buying SATA terrabyte drives, but it's nice to be as efficient as we can be. Rockin' trailer, man. The nanomeks look so cute! The whole green "warning" image was also very nicely done. I did a double-take on that one. "Rated M, blah blah robots... wait, what?!" The ratings and achievements look awesome. Those kinds of systems are what tend to drive me to play a game over and over in order to get it all. Can you imagine me about ten years ago, when Pokemon first came? My neck was a wreck. If C64 doesn't rank highly, I'll personally come and molest all of you. Grrrrrrrr! I'm amazed that you're actually managing to get it down to 25-30 megs. I actually still, to this day, experience that people complain about 50 meg downloads (particularly people with slow connections, I suppose) so that'll certainly count in your favour, I think. How much would the game hog with all graphics and things uncompressed? If C64 doesn't rank highly, I'll personally come and molest all of you. Grrrrrrrr! Yeah, Poo Bear puts that at the top of the 8bit era! I was a spectrum fan myself - Obviously the hardware was outclassed by the C64, but I think there's a lot of great games that only came out on the speccy. I actually still, to this day, experience that people complain about 50 meg downloads (particularly people with slow connections, I suppose) so that'll certainly count in your favour, I think. How much would the game hog with all graphics and things uncompressed? Data folder is about 160 meg, so probably about another ten meg on top of that with all the other bits. If you counted the textures as source (before they are scaled down and sharpened) you are talking about 4 times that - although it would only look better if there was some kind of first person view. Third person actually looks worse, because you never get to see the top level texture, and hardware scaling used to make the mipmaps isn't as good as doing it yourself. Darn the people don't complain about ea releasing a 1GB demo for BF 2142!!!! And this is not the first.. I think I would be old before this game is made!! blue robots are best i loved the video. i try to make it sound good (you did win the award right?) and make someone check the english for me but i do not see they pull links so it is messy. now i cannot edit it rubiish shoutwire. Thanks anyway! I hardly have time to work out how all these new sites work - I think someone put the War Angels trailer up on there too when we released it. It's great to have people like yourself act on our behalf like a marketing department - obviously we couldn't afford our own! I'll have to sort out what the Mr. Robot jedi rank is going to be. Just a couple of quick things I noticed about the video player -- When the "back to start" button is pressed when the video is playing, the "play/pause" button isn't updated correctly. It still shows the "pause" icon, even though the video is already paused. Also, it doesn't seem to work on my Linux box. I'm thinking that the problem stems from the latest version of flash available for Linux is Flash Player 7 instead of 9, so I don't really expect you to do anything about it, I just thought you might want to know. On a side note -- does anyone know if there's a way to get Flash Player 9 for Linux? I tried the official Adobe download, but it landed me with 7.